Jules (Drayton, United Kingdom) on 28 February 2013 in Architecture and Portfolio. The beautiful chancel ceiling was added c.1500 by William Orchard. 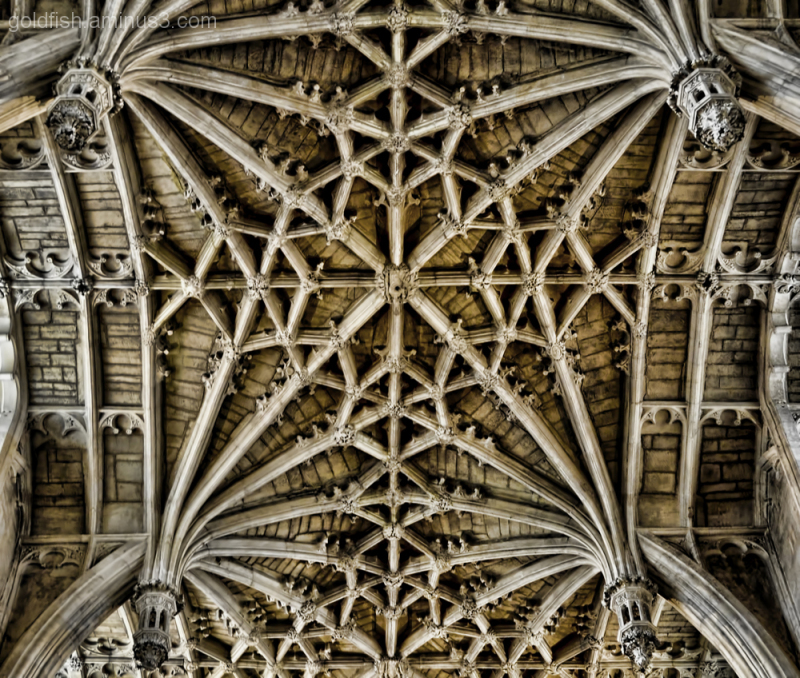 It is very similar to Orchard's elaborate stone carved lierne vaulted ceiling at the Divinity School in the Bodleian Library. Christ Church Cathedral is the smallest cathedral in England and the seat of the Bishop of Oxford. It is unique in serving not only as a cathedral but as the chapel of Christ Church College. What is today Christ Church Cathedral began as a Saxon monastic church founded in the 8th century by Frideswide, the patron saint of Oxford. Frideswide was a Saxon princess who committed herself to chastity and became a nun, fleeing the marital advances of King Algar of Mercia. Nothing remains of her original church, but a Saxon cemetery was recently discovered beneath the cloister. amazing intricacy! Lovely frame, Jules. We have a local, and rather modern version, here. Oh wow the details are fantastic, such incredible craftsmanship in this ceiling. wow . . you are extracting the most from this - very impressive. Very good shot, lots of detail to pick out. Wonderful ceiling, how on earth did they manage to do it. So impressive. Quelle merveille architecturale, splendides détails. Bonne journée. Wouhaaaaaaaaa! superbe et un cadrage au top! Fantastic shot of the amazing ceiling !!! fantastic architecture in a site so full of history. It is, like above commenters expound, just incredible to see. The artists somehow enhanced the original ceiling and at the same time added reinforcement and beauty that blended with it. Artists, not just skilled craftsmen, that took. It so arrests the soul, these old cathedrals, and I so appreciate your stories and descriptions. Thanks Jules! Perfect framing, and it has amazing wow factor I love it Jules. WOW! I love the patterns and shapes. AMazing! This ceiling is magnificent. Beautiful architecture and detail. Brilliant architecture ! That, is amazing. Whooooooww ..... beautiful architecture to the ceiling, the sculptures are beautiful. Excellent shooting.